If work has become your excuse for skipping out on working out, we’re here to make that go away. Keep this list in handy if dancing is something that interests you, because these Zumba classes around town are here to help you reach your fitness goal. Best part? All these classes are super easy on your pockets too! Attend Kunal Jessain’s Zumba class at Bandra – and try keeping up with the high-intensity beats. Jessain is known for being an energetic teacher who pays attention to individual students. Also, with classes in Juhu and Bandra, you have your choice for whichever one makes your commute easier. Sculptasse organizes classes at various places in the city. You'll get a solid workout, so all you need to do is just call them on 8652273780. Something for the residents of Borivali – head to Pride Power Yoga and Aerobics studio, and get on your zumba mojo on. These classes tend to get crowded – but are a lot of fun to attend anyway. They are affordable and we love their music selections as well. Swetha Jairam, a fitness and pro-zumba instructor will teach you the ways of high-intensity fun and results of zumba at her classes in Kemps Corner. Sign up, and you will be moving and dancing to Latin beats and with energies soaring higher than the sky. Zumba with Illumination has been started by Sanjeev Khaira. The zumba instructors teach at least 12 branches across Mumbai – and the sessions come with good recommendations. So if you live in Goregaon, hop off to the nearest studio you and get set with zumba. Learn to Zumba with Philip Manuel – who has been teaching and doing zumba for years now. Try keeping up with his fast-paced beats, but make sure to carry on your bottle of water to sip on in between breaks. If you live in Sion, then we have something for you as well. Hit up Arts in Motion which is a fitness studio that offers dance classes, zumba, aerial silk yoga and more. On Mondays, Wednesdays and Fridays, sweat out your weekday cheat eats here. Price: INR 500 per session, INR 3,500 per month To book your session, go here. This studio in Matunga is all about dance, and they ensure all their students are in great shape with all the different types of dance styles that are taught there. At less than 300 bucks a class, we think this is a great deal! 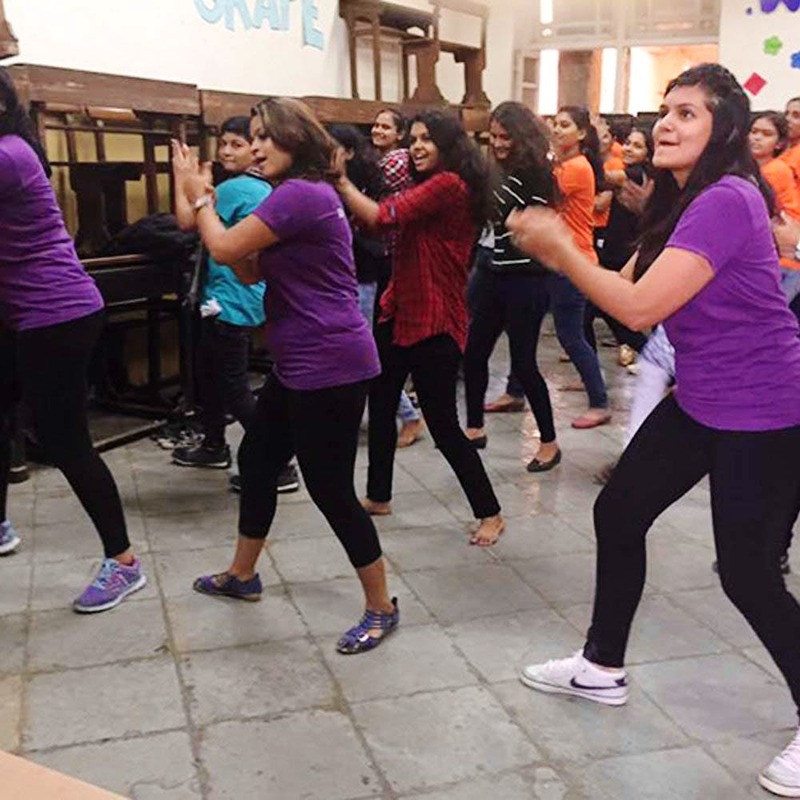 Sign up for super fun, super intense Zumba classes and dance your way to a fit body with the help of professional trainers at this dance studio in Lokhandwala. They also teach other dance styles and workouts that include folk dance moves, Shiva Dance, Kalaripayattu, Bollywood fusion and much more. #LBBTip- They offer free trial classes too! The directors of the studio are a trio of women who are passionate about dance and fitness. If you’ve got Zumba on your mind, you must check this out for their amazing teachers, dedication to your personal growth and a comfortable vibe that has students signing up month after month. #LBBTip- They also have classes on Bollywood dance, hip hop, belly dancing, jazz and contemporary, hatha yoga and more. Get your dose of energy with Apuorva Sinha as she conducts these crazy, kickass intense Zumba sessions in Marol. Sign up for her energy, training, good vibes and a whole lot of cardio and muscle conditioning. If you’re looking for Zumba lasses around Lokhandwala, check out the Yoga Loft for some affordable and fun fitness classes. Apart from regular Zumba, they also conduct Bollywood Zumba classes. The studio is super pretty which means you will get gorgeous post-workout pictures. Breakbeat is a dance studio in Tardeo and is known for offering unique dance fitness classes. Sign up for regular Zumba classes, or if you feel dance isn’t your thing you can always try out Bokwa too, a dance fitness form for people who have 2 left feet. They might be known for their yoga classes, but their Zumba classes also pack in quite a punch. Sign up to dabble in interesting workouts that combine Zumba and yoga. You also have the chance to combine both yoga and Zumba classes in a monthly membership. #LBBTip- You can also pay per session if you are not sure about joining. This gym lets us do so many different workouts, but it is the Zumba classes that we are addicted to. This gym is a fully functional gym which allows you to workout in a clean, elegant environment and try out unique and different forms of workout. #LBBTip- they also have a juice bar here to kill that post-workout hunger!